, corresponding to amino acids 1-19 of Human HDAC4 conjugated to KLH with C-terminal added lysine. WB: HeLa, NIH/3T3, P19, Jurkat and PC-12 cell lysates; Rat brain lysate. Total cell extracts of NIH3T3 fibroblast cells. Our Abpromise guarantee covers the use of ab12171 in the following tested applications. WB Use a concentration of 1 - 2 µg/ml. Detects a band of approximately 140 kDa (predicted molecular weight: 119 kDa). Lanes 1 - 4: Merged signal (red and green). Green - ab12171 observed at 140 kDa. 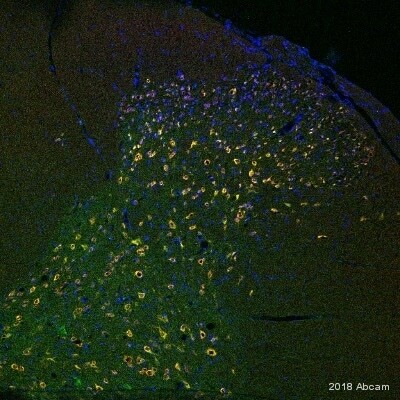 Red - loading control, ab176560, observed at 52 kDa. ab12171 was shown to recognize HDAC4 when HDAC4 knockout samples were used, along with additional cross-reactive bands. 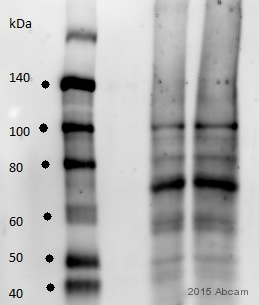 Wild-type and HDAC4 knockout samples were subjected to SDS-PAGE. Ab12171 and ab176560 (loading control to alpha tubulin) were diluted at 1 µg/ml and 1:10,000 dilution respectively and incubated overnight at 4C. 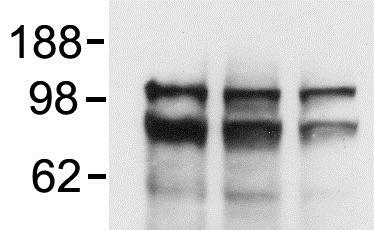 Blots were developed with Goat anti-Mouse IgG H&L (IRDye® 800CW) preadsorbed (ab216772) and Goat Anti-Rabbit IgG H&L (IRDye® 680RD) preadsorbed (ab216777) secondary antibodies at 1:10,000 dilution for 1 hour at room temperature before imaging. Publishing research using ab12171? Please let us know so that we can cite the reference in this datasheet. 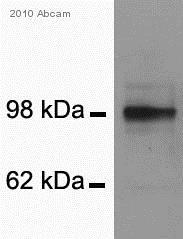 Would like blocking peptide for this antibody. Thank you for your earlier call and for your patience while I have looked into your enquiry. I apologize that it has taken so long to get back to you. I have asked the lab if the blocking peptide for ab12171 is available for sale, and unfortunately we do not produce this for sale. You can, however, have this peptide custom-synthesized. I am sorry that we do not have this product available, but please let me know if you have any questions or if there is anything else that we can do for you.